Gold traded sideways in Friday’s day session, and nicely higher in the overnight session! We have now reached a high of 1266.90. Gold has rallied within our 23.6 to 38.2% retracement zone for all of our current wave !iv! rally, so if our current analysis is correct, we now need to be on guard for the completion of all wave !iv!. Upon the completion of wave !iv! we expect a wave !v! 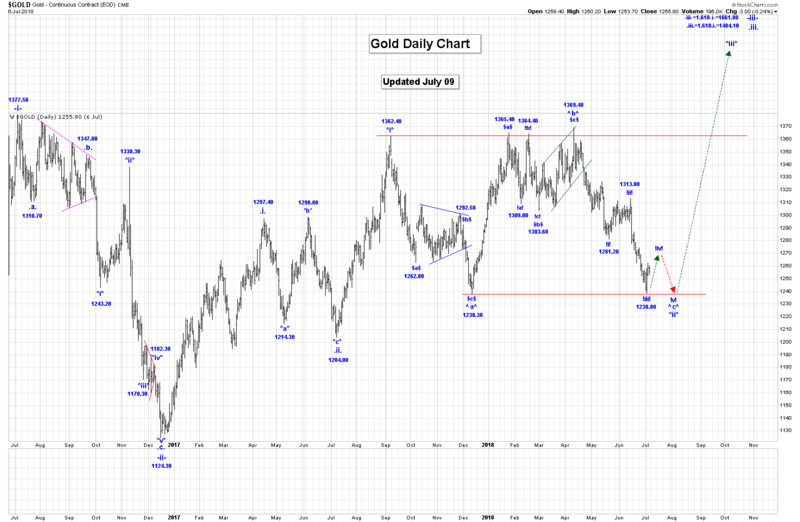 drop that should send gold back to at least our 1238.00 level, to complete all of wave ^c^ and *ii*. On the intraday chart the rally from 1238.80 to the current high of 1266.90 looks like a 3 wave pattern, which is suggesting that once this pattern ends, gold will be heading lower again. There is an outside chance that all of wave *ii* is 100% complete at the 1238.80 low, but those odds are low in our opinion. Trading Recommendation: Go long gold on pullback towards $1240. Use put options as stops/risk management. Active Positions: We are long and strong, with puts as stops! 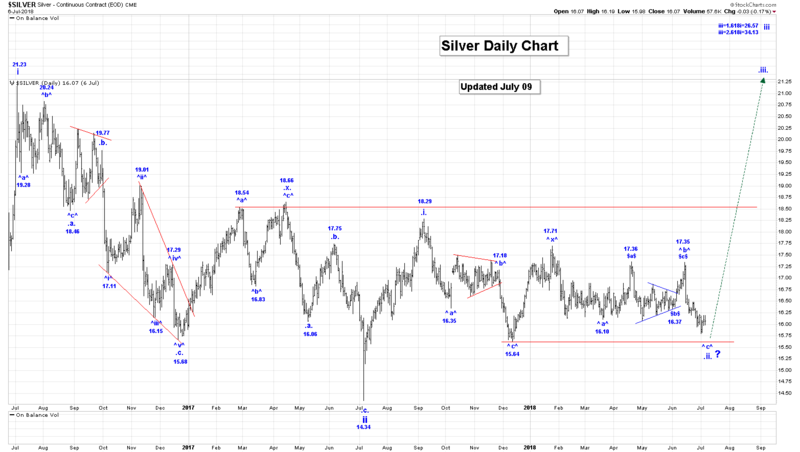 Silver also traded sideways in Friday’s day session, but in the overnight session we rallied to reach a high of 16.26. We are still expecting another drop in silver that targets the 15.64 low, as we continue to work on our double 3 wave complex wave .ii. corrective pattern. Like gold, on the Intraday Chart it looks like the rally from 15.80 to the current high of 16.26 is a 3 wave corrective pattern, that once complete is suggesting that silver will be heading lower again. Upon completion of wave .ii. we expect a sharp rally in wave .iii., will be the next major event in this market. The US 10 Year T-bond yield was lower in Friday’s day session. In the overnight session we rallied to reach a high of 2.858%. We continue to decline in our expected wave (ii) correction, with all of wave *a* of (ii) ending at the 2.759% low, and likely all of wave *b* at the 3.009% high. 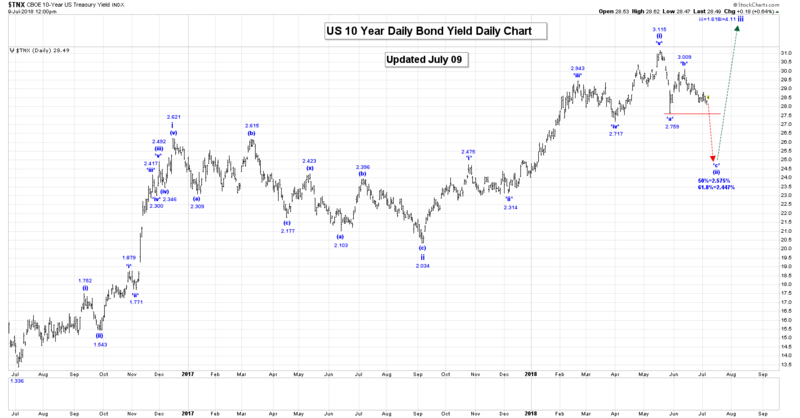 If that is the case, we should now be moving lower in wave *c*, as shown on our “Daily US 10 Year Bond Yield Chart”. Our minimum target for end of wave *c* is the wave *a* low of 2.759, but we do have our 50 and 61.8% retracement levels. These are much lower, as shown on the chart. Trading Recommendation: Short US 10 Year Bond Yield, risking to 3.120%. Active Positions: We are now short the US 10 Year Bond Yield, risking to 3.120%, with a target of 2.50%! Free Offer For 321Gold Readers: Send me an email to admin@captainewave.com and I’ll send you a free report on GDX and Barrick Gold Corp! I highlight both the short-term and long-term wave counts, with prices for enthusiastic gold stock investors to take action!